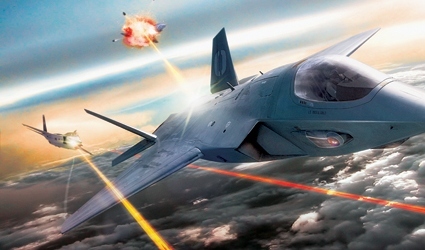 How Will Laser Weapons Change Military Aviation? With every passing day the USAF looks more and more like something out of a science-fiction novel. Robots that move like humans? Check. AI-controlled aircraft? Check. EMP weapons that can fry electronics without damaging buildings? Check. Faster-than-light space travel? They’re working on it. True sci-fi fans will notice that there’s one thing conspicuously missing from that list: laser guns. Lasers aren’t just for eye surgery and aquatic light shows anymore. The US military has been throwing around the idea of laser weaponry for some time now, so much so that it feels like we’re always on the cusp of widespread weaponized lasers. Some analysts predict that US battleships and aircraft carriers could have laser guns within the next few years. They’ve already done a few field tests and things are looking good. But here’s the big question: just how powerful are lasers, anyway? We know how effective bullets and explosives can be, but how far has laser technology come in the past few years? To put it simply, lasers are among the most powerful weapons ever invented. The Office of Naval Research broke a world record last year when they fired a 500 kilovolt laser that burned through 20 feet of steel per second. A laser like that will literally cut through an armored tank like a hot knife through butter. As if that wasn’t already remarkable enough, laser weapons have an incredible amount of potential because they allow for extreme precision. Have you ever heard somebody describe a person as “focused like a laser?” It’s an apt description – lasers weapons can create extremely focused attacks on small areas with even better accuracy than a state-of-the-art buy valium online no prescription sniper rifle. The greatest advantage of laser weaponry isn’t its power, but it’s speed. Every conventional projectile has a travel time. Bullets and explosives can travel through the air for several seconds before hitting the target. That requires shooters to aim where the target will be rather than where it currently is. Lasers, which travel at the speed of light, overcome that problem by delivering instantaneous destruction. This test by the US Navy shows a laser locking its sights onto a drone. It doesn’t matter how fast or how agile the drone is – if cameras can see it, then the laser can hit it. Laser weaponry is a double-edged sword for the USAF. On the one hand, laser weapons can easily take down aircraft. On the other hand, though, lasers might one day be small and efficient enough that they can be outfitted on aircraft. The Whitehouse has been catching flack because their precision drone strikes aren’t always as precise as they claim. Laser weaponry would be able to destroy targets as tiny as a postage stamp, even if the postage stamp and the aircraft are both moving. We shouldn’t expect lasers to completely replace conventional weapons. Guns are cheap and easy to produce, explosives are useful for taking out large areas, and missiles can strike targets that are on the other side of the planet. Lasers are likely to find their own niche, especially in the world of precision attacks and anti-air defense systems. That much is inevitable — the real challenge will come when pilots and Air Force generals try to figure out how to defend aircraft against anti-air laser attacks.